Compare and Contrast lesson plan activity time: 20-60 minutes, depending on use of optional exercises. If all sections are used, lesson can be divided into separate sessions if desired. 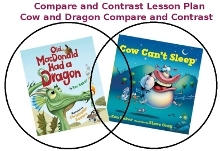 Objective of Compare and Contrast lesson plan: Help teachers achieve common core standards for comparing and contrasting, by teaching students how to compare and contrast using characters and elements of two different picture books. Discuss the concept of comparing and contrasting. Comparing: Explain to the students that comparing is when you identify things that are alike or similar between two or more things. For example, you could compare a granola bar and a candy bar, asking the students to suggest ways that the bars are similar. Their responses might include rectangular, edible, sweet, brown, etc. Contrasting: Explain to the students that contrasting is when you identify things that are not alike or that different between two or more things. You can use the granola bar versus candy bar example again, but ask students to suggest how they’re different. Tell the class that you’re going to read them two different picture books and that you want them to think about ways the books are similar and different as you read them the stories. Read to the class the picture book Old MacDonald had a Dragon, followed by reading the picture book Cow Can’t Sleep. After reading the stories, write “Alike” on the top middle of your chalkboard. Then write “Old MacDonald had a Dragon – differences” on the top left and “Cow Can’t Sleep – differences” on the top right. Ask the students to name things that were similar between the two books and write those on the chalkboard under “Alike”. Responses might include things like Farm, Farmer, Cow, Pig, Sheep, Funny, etc. Next, ask how the stories are different. Differences for Old MacDonald had a Dragon might include Dragon, Motorcycle, Dog, Guitar, Daytime, Singing, Burp, Lifelike Pictures, etc. Differences for Cow Can’t Sleep might include Horses, Ducks, Nighttime Sneezes, Water Well, Silly Pictures, etc. Explain that sometimes it helps to see the similarities and differences between things by creating what is called a Venn diagram. Create a Venn diagram on the board by drawing a circle that encloses all words under “Alike” and all the words under the left side “Differences”. Draw a second circle that encloses all words under “Alike” and all the words under the right side “Differences”. Explain that where the circles overlap shows the items’ similarities, and where they don’t overlap shows the differences. 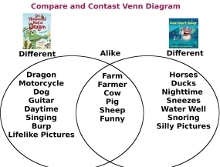 Give each student a copy of the Compare and Contrast Create-Your-Own Venn Diagram Handout. Ask them to use the handout to make their own Venn diagrams, listing the similarities and differences between the characters and items on handout from the picture books you read to them (i.e. sheep vs. wool blanket, ducks vs. pillows, farmer vs. farmer) and then drawing circles around them to form Venn diagrams. Have the students share the differences and similarities that they listed. Discuss and make any needed additional explanations about comparing and contrasting to reinforce students' understanding. Explain to the students that comparing and contrasting can also help them identify things that are similar, but have slight differences (Note: “similar” and “but” are helpful words that students can use when comparing and contrasting). Explain to the students that the book Old MacDonald had a Dragon has several repeating phrases that are very similar, but with slight differences. Tell them that as you read the book to the students, that they should listen for those repeating phrases. Tell them that whenever you start to say a certain repeating phrase, that you want them to say it aloud with you. But also have them pay attention to the slight differences between each repeating phrase.